Our live Web site traffic statistics service can be used to analyze visitor traffic to your site in real time. Our Web traffic statistics service features useful Website traffic information about visitors to your site. 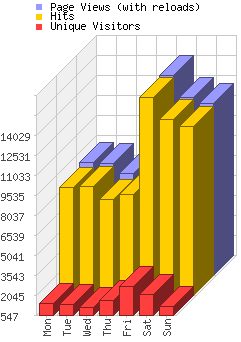 Visitor information is displayed in 3D graphs for easy visualization of the data. Read over the information below to find out more about the features of the traffic statistics that are provided through this service. 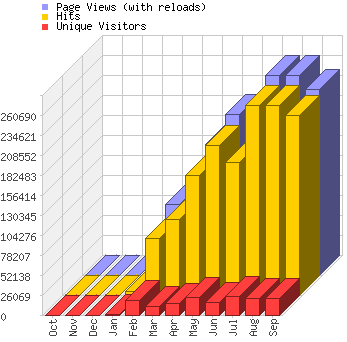 On the graphs below we see three primary statistics: hits, page views, and unique visitors. A unique visitor is one visit from a particular visitor over a certain period of time. So if a user spends 10 minutes browsing several pages of your web site, this would be one unique. A hit occurs every time a user opens a page on your Web site different to the previous page they viewed. Refreshing the same page for instance won't count as a hit as it isn't a new page view. Page views are the total number of page views regardless of it being a unique visit, the same page loaded again, or a different page. Visitor Statistics can be viewed in real-time reports and graphs grouped by the hour, day, week, month or year. You can choose the date range on any report using this simple control. 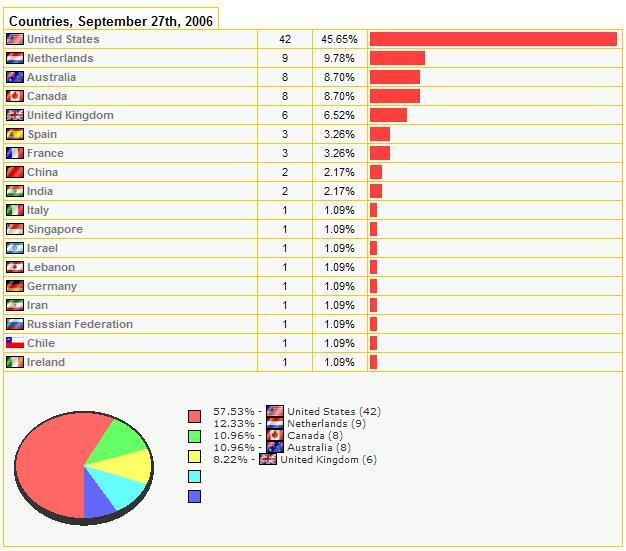 This is a quick summary showing the last 50 visits to your Web site. The browser display quickly and graphically shows you your visitors' browser usage. The actual numbers and the percentage usage are displayed. It might be important in determining what your Web site will look like in other browsers. 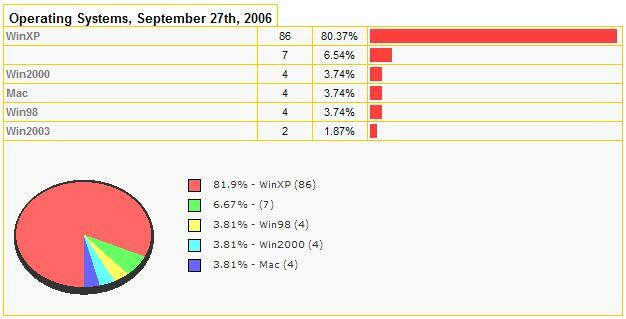 Systems displays the numbers and percentage of usage for your users' operating systems. This provides information for determining operating system specific functions in combination with the browser display. This is an extremely important statistic as it shows you the major countries your visitors come from. Perhaps you are missing a market due to a language barrier. Maybe you are missing sales since you don't specifically ship to a country. Keep an eye on this statistic. Referrers will hold the important information as to where your visits are coming from. A portion of your visitors will be direct views from their own bookmarks. Others however will come from other Web sites or online searches. This information can be used to judge marketing campaigns, search engine optimization, and link exchanges. Referring URLS: When a user clicks on a link that directs them to your Web site, the page they came from is known as the "Referring URL". Search Engines Used to Find Web Site: This statistic reflects which search engines are providing you with traffic. This can be important in determining how you need to optimize your Web site. Perhaps you are doing well in Yahoo, but what about Google, MSN, and other important search engines? Search Keywords Used to Find Web Site: This will display the search terms people use to find your Web site. This is another useful tool in determining the origin of your visitors. Are people finding your Web site using the keywords that best reflect your Web site? Popular pages keeps a tally of what pages visitors view the most on your Web site. This can be useful for seeing what people find of most use or interest on your Web site. Entry and exit pages are the first and last page a user visits on your Web site respectively. The pages at the top of the entry list are those which are most easily found by your users. The exit list will show you the pages your users are most likely to leave your Web site. Paths are a fantastic way to track your visitors usage of your Web site. They will show exactly how a visitor moves through your Web site. From the referring URL, how long they spend, to where they leave your Web site. This is a good tool to truck the effectiveness of your navigation or information layout. Perhaps you are wondering where a Web site sale is falling through? This may just show you that information. A simple statistic showing how long a visitor spends on your Web site. This is never a exact science due to the nature of the World Wide Web, however this will give more than a rough guide to how long your visitors stay on your Web site.